In natural light there is normally one source – the Sun. This can be regarded as the primary light source for photographic purposes. However, we do not normally refer to the Sun as a key light. The Sun creates the ambient natural light. Natural light, for photogs, is a type of light in its own right. Sunlight, and the atmosphere, together create the colours and light intensity in an open air scene. As photographers, we realise that there is a huge range of colours and intensities in day light. So it is the properties of natural light that we should become sensitive to for taking great photos. We normally regard natural light as a specific type of light source. It can, however, be used as part of an array of other light sources to light a scene. You can add other types of light to natural light in an image. You might include artificial lights, reflections, diffused or coloured lights. Sunlight can be further changed by various forms of light modifiers. Sunlight is the main source of our natural light. It is created by a range of different wavelengths of light radiating from the Sun. 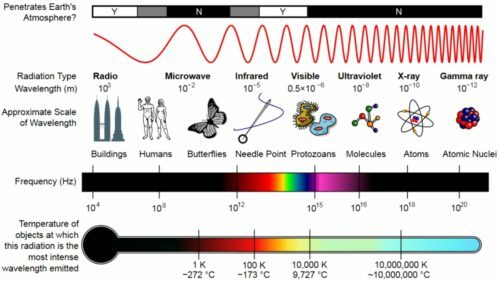 By definition, visible light is the part of the electromagnetic (EM) spectrum to which the human eye is sensitive. The visible wavelengths only include light that we can see. Other forms of EM radiation (which we cannot see) also exist. Visible light is actually a very small part of the EM range. For detailed information on the EM spectrum see this Wikipedia article. This diagram below shows properties of the full EM spectrum, not just the visible range. Diagram showing some of the properties of the full EM spectrum. The full spectrum of visible natural light wavelengths is broadly as seen in a rainbow. However, rainbows show variations on the complete spectrum according to local conditions. Light passed through a prism can be split down into component colours. You can see a diagram of a prism working on Wikipedia . The image below shows the visible light spectrum in its component colours. Diagram showing the visible light spectrum. Seen on the NASA “Science HQ” website 01/09/2017. The human eye can distinguish many more colours than most people can name! Estimates of the number of colours any individual can see vary. Modern screens tend to work in “True color (24-bit)”. The “True Colour” standard can potentially display 16,777,216 colors. However, humans probably do not see more than 10 million colours. At the lower end of the estimates, tests confirm that we are able to see around a million colours. In reality, most of us may be only able to point out around 1000 different colours. 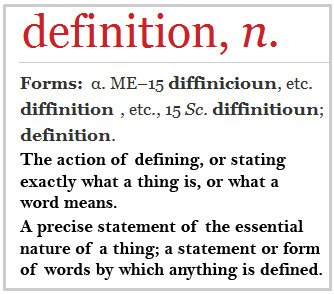 To see more we need training and an extended vocabulary. True color, mentioned above, provides 256 colours for each of the three Red/Green/Blue (RGB) colours. This colour depth means that a large number of colors, tones, and hues can be displayed in high-quality photographic images like those from a good digital camera. Find out more about the range of colours available to digital sensors and colour screens in this Wikipedia article: Colour Depth . Isaac Newton carried out early controlled experiments on natural light. His work on prisms helped us understand the way natural light splits down into a spectrum. A rainbow, and light from a prism, both exhibit a range of colours. A school mnemonic gives us the clue to the colours: ROYGBIV. These colours found in the spectrum are red, orange, yellow, green, blue, indigo and violet. However, Newton also found that white light is created from mixing those colours again. If you paint the colours onto a wheel as segments (Newton disc ) and spin it very fast you see a continuous white colour. See some Newton discs here . The fact that white light is created from all the other colours explains the complexity of natural light. It also helps explain the colours that we see under different atmospheric conditions. As a photographic light source, the sun is an example of a hard light. Although very powerful and large, it’s distance from us makes the Sun a small, point source, of light. This tends to promote sharp, hard edges on shadows. Also, the scene conditions under trees, mountains and other ground level objects can affect the local photographic conditions. Natural light, like all light, has colour temperature. Visible light of all types has its own colour properties depending on the mixture of light wavelengths in the light. Generally, but not exclusively, light comes from thermal sources. The Sun is extremely hot. Its colour temperature is normally around 5,500 to 6,000 Kelvin. The Kelvin scale is an absolute scale of temperature. Colour temperature is scientifically measured. Comparing colour temperatures helps us to match light sources. 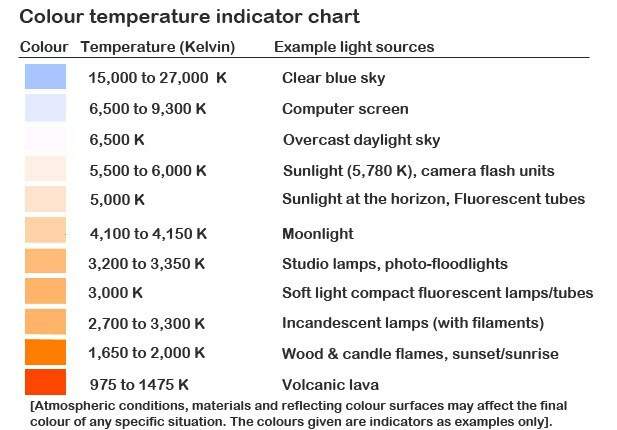 The chart below shows some colour temperature examples. The chart shows the different colours generated by thermal light sources. As I described earlier, many things affect the properties of light. Some or all of those can also affect the original colour temperature of light. However, it is useful to measure colour temperature as it helps to determine the impact that different light sources may have on images. Colour temperature helps us to understand the light we use to artificially light a scene. As sunlight is at approximately 6,000K Kelvin, we can adjust artificial lights to emit the same colour temperature. This is called daylight adjusting a light. Such adjustments really help us to simulate daylight scenes under artificial lighting conditions. Colour casts can be created by artificial lights. When under artificial lights we often don’t notice that the colour is not the same colour as daylight. But, when we see photos from under artificial lights we see distinct colour casts. You might see yellow light in photos taken under fluorescent lights. A distinct, but dull orange tinge is often seen in photos taken under Tungsten lights (a household incandescent bulb). Your camera has a setting called White Balance which adjusts this colour cast to look more like daylight. Using that setting effectively removes the colour cast. It should be of no surprise to photographers that natural light is so rich. It is one of the reasons we love photography! More to the point, it is the reason we can be so creative with light. Soft light (A ‘Glossary’ entry).